Phew, we are nearly finished the 31 Day Challenge. It's been a tough slog this year, although I probably say that every year! But it's been ages since I've done a post every night for this long - it's exhausting and starts to take the fun away from it again. Today's prompt is fashion, and it's one of my least favourite prompts in the challenge. I have no clue on fashion really, so I just end up googling different red carpet events with the hope of finding a dress that jumps out at me for nail art. I eventually found this dress that Kate Hudson wore to the premier of Bride Wars, and it's geometirc pattern looked like it would translate well to my nails. All of this is free hand, except for the finest little dots which I stamped on. My inspired by fashion nails from 2013, 2014 and 2015! 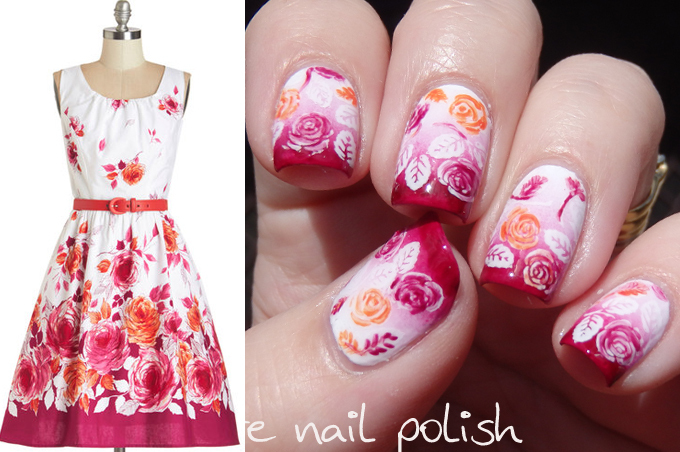 Oh, that dress translated really well to nail art! Great design!